So if you are a loyal Flashback Universe fan who has been patiently waiting for the next FBU comic since we released The Paladin, you're probably wonder what the hell is up with us not releasing any new comics lately? Well, what has happened is that for several reasons we had a couple of artistic hiccups that have slowed us down. One you know about if you've been reading this blog, and that's Pierre's long engagement working on the Arthur cartoon. That took a good bit of his time over the past year. However he has been able to work on a few Flashback related comics during this time. Aside from Arthur, Pierre was also working on our Zuda submission. Chris is also working on a Kondorr comic with a new artist who goes by the moniker of Cornfed Cannibal (long story...) Check out these pages from Kondorr - Once Mighty! And last but not least, we are very near completion of a comic featuring Amanita and Prometheus written by Chad Bowers and illustrated by Chris Nye and Don Jackson. Check out this great cover by Don and colors by Liezl Buenaventura and interior page by Chris. So look for some great Bronze Age excitement to be coming from us very soon! Today, the HIGH MOON crew are celebrating it's 1-year anniversary running on ZudaComics.Com. I credit this series for changing my view of Zuda and helping me appreciate the whole Zuda concept. If you are a fan of HIGH MOON, be sure to check out this latest installment, leave a comment, and share it with your friends! By far..... Bob Morane has been the best show I have worked on. It is the TV show I am the most proud of so far. Heck at the time, we thought we had a winner. We thought we would do at least 12 seasons of that series. Previously I mentioned how I could go to various studios in person and apply for work. Ironically, that was not the case for Bob. The mother of what would become my future girlfriend at the time (but who now is my ex-girlfriend ;) ) had seen an article in some paper about a studio looking for artists. She gave me the phone number she got from the article. That was before I started working on Scary. I was still looking for work at the time so I called the studio and spoke with one of the producers who gave me their mailing address and told me to send to the director of the show, a great guy named Norm Leblanc who had directed the Flash Gordon TV series, my CV and some portfolio samples. Then some time later, I was hired on Scary and pretty much forgot about that. Until I got a phone call giving me an appointment to meet with Norm. I was working on Scary. Although I was about done working on the design team on Scary, I had applied to work on the storyboard clean-up on Scary (yes..... again it meant doing another test..... even though I was already working on Scary) and was told I had the job. But I figured..... let's go anyway. The worst that can happen is that I turn down the job on Bob Morane. So during my lunch hour, I went to meet with Norm. I was very impressed with Norm's enthusiasm. And he seemed to really want to hire me, he started showing me a truckload of designs they had done. Then he took me to the coloring department and started showing me a lot of color samples they had done to establish the style of the series. I was hooked. I wanted to work on that show. So as expected..... Norm gave me a test. It was a character rotation to be cleaned. So that very evening, I did the Bob Morane test after work, and the very next day in my lunch break I brought back my test to Norm. I had already warned my bosses on Scary that I might be leaving to work on Bob Morane instead of working on the storyboard clean-up on Scary. I asked them if they had anyone in mind to replace me if I did not take the job. They said not to worry about it. They had someone else in mind if I was no longer available. So a few days later, I got the job on the Bob Morane design team. So from that day.... I always try to meet the people who offer me work before saying no (or before saying yes for that matter ;) ).... just in case. The guy who was taken in my place on Scary is a guy with whom I went to college with called Azad Injekian. Some of you may know him as the creator of the comic "Sammy: the tourist trap", a series that was published by Image Comics in 2003 if I am not mistaken (great series by the way). But that is not the funny part.... the funny part is that Azad had also applied on Bob Morane. If I had stayed on Scary, Azad would have had the job on Bob Morane. But since I left for Bob, he got the job on Scary. So I started on Bob Morane as a clean-up artist. Which essentially meant that I would do pretty much anything required of me. From fixing some props, to cleaning-up character or location designs, inking an early version of the series' logo, or even helping out on correcting the storyboards if needed. In retrospect, I was wayyyyy too inexperienced to be working on a series like Bob Morane. It was not easy. But in the first few months that I have worked on Bob, I learned more then I did in all my years in college. I also had the pleasure of working with a great guy called Gabriel Morisette who worked for DC on various series like Ragman, Team Titans or Hawk & Dove or some other series I can't think of right now. He also had his own comic called Angloman. Then I applied to work on layout & posing for Bob Morane, and another series called Ivanhoe. So I spent a couple of week-ends doing the Bob Morane and the Ivanhoe layout & posing tests. But this time, not only did I have a better idea of how layout and posing worked from all the tests that I had done before, but also I was right there in the studio and could ask for tips and advices to some of my co-workers if I needed to. Let me tell you.... it is much easier to get a job once you are inside and know some of the people in the studio then when you are trying to break in from the outside. This time.... both tests were good enough. So I had to chose between doing layout & posing either on Bob Morane or on Ivanhoe. But for the first few days..... I almost regretted my choice. That first week, I had the posing of 25 scenes to do for Friday...... and by the end of Tuesday.... I had only done 2 scenes. I was thinking to myself..... I will never make it. I'll be fired Friday. But as it turned out, the first few scenes were the really tough ones. Then it got easier with later scenes, and the last few scenes were very simple to do. So by Friday, I was able to hand in my 25 scenes finished with some time to spare. I remember saying to my boss something like..... 35 scenes is too much.... but she told me...... you just made 25 scenes in your first week..... you can do 35 now. Also doing layout & posing paid you for the amount of scenes you made. So the more scenes you made..... the more money you made. When I started on Scary, I was making $450 per week. Which was awesome at the time since I was finally getting paid to draw. Then I was making $700 per week on Bob. Which was the most money I had ever made at the time. But then working on layout & posing, I was making $1200, $1400, heck sometimes as much as $1600 per week. I foolishly thought that I had made it. That from now on, it would always be like that. But sadly... that is not how it works. 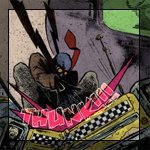 In which our hero makes a daring leap for freedom and gently lands on a futuristic taxi. For reasons I can't explain yet, I was too busy to post any new public domain cbrs to my site last night, so I'd like to take this opportunity to direct you to two sites with a wealth of awesome Golden Age comics content. 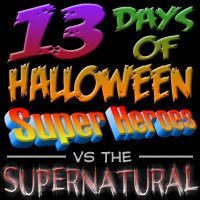 So you're going to get Super Heroes battling all kinds of supernatural/Halloween-y things. Even if they aren't really scary stories. 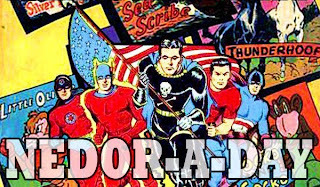 Check out the amazing list of Golden Age characters listed in this sites CONTENTS sidebar! True to it's name this amazing site is devoted to the great Nedor Library, and never lets me down in the quality department! So please check out both sites and tell 'em Jim sent you! 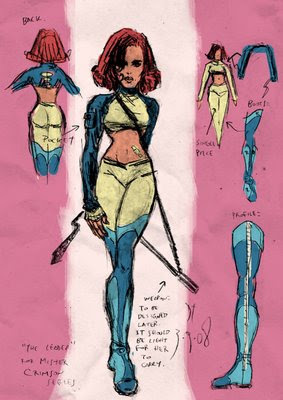 I introduced readers of this blog to Diego Tripodi about a year ago when I first interviewed many of the creators involved in Flashback Universe, but he's only half of the team on Mister Crimson. Today, I'd like to take this opportunity to introduce everyone to Seth Sherwood, writer and co-creator of Mister Crimson. A person that gets very little sleep. I live in Los Angeles. I have a wife and 3 year old son. I have an undergraduate degree in design/photography and a graduate degree in creative writing. I spend my day doing motion graphics, print design and video editing for a media outlet; my nights writing screenplays, comic scripts and novels; and my weekends being an amateur filmmaker. A million years ago I registered the domain name. It was a play on words of sorts-- a combination of Think Tank and Lab. My original intent was to have a website where I could try out various artistic ideas. I was going to invite friends to participate, and create an online space to experiment with art, design, programming and narrative. But it never happened. When I needed work, it was a resume/portfolio site, but I'd often yank it down as soon as said work was found. Now, it's just a temp page, but in reality holds various files I need to keep online. Videos, script pages, etc. Plus it's my email server. Just to make it easier on my limited memory, most of my online accounts on blogs, message boards and communities are some derivation of "tanklab." Who are some of your favorite writers - both in comics and not in comics? For comics, I follow the early Vertigo guys. Gaimen, Morrison, Ennis... Warren Ellis especially. I love his sci-fi approach to pretty much every other genre. For TV, I'd have to give credit to Mathew Weiner and his staff for Mad Men. It's probably the best written TV I've ever seen. For films, I'd have to say Paul Schrader for really pushing the envelope of darkness in mainstream cinema. He wasn't the only one doing it, but he did it consistently for several films. When it comes to books I'm a big fan of William Gibson and Jonathan Letham. Both of them started in sci-fi, but had such a mastery of language that they transcended the genre. What was the inspiration for Mister Crimson? Diego's sketchbook! Diego is my brand of crazy. I look at his stuff-- the angels, the demons, the stinky clowns, the naked women, the talking skulls-- It's all so, so much of what i see in my head! He had a sketch of a guy in goggles that really stuck with me. I can't remember the context of it, but I knew he had been wanting to draw some pulp era style heroes. That idea, combined with my nature to drift toward sci-fi, made me think of a scenario where a pulp hero might be in a futuristic world. It wasn't long before The Shadow, The Spectre, The Phantom, Blade Runner, Metropolis and what not started to pop into our heads and give us ideas. How did you meet Diego, and how long have you been working with him? 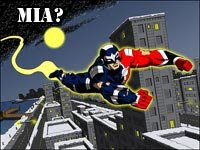 I was looking for an artist to collaborate with via a digital webbing ad. The idea I had cooking was about this Jason/Freddy/Michael Meyers sort of brute. Some immortal thug that goes on killing, but is now trying to make amends for it. He needed a mask, of course, and I have an obsession with luchadores and their head gear. When Diego answered the ad, his sample pages were of a luchadore, in a muscle car, in the desert with zombies in the distance. It was a perfect match. That was a couple years ago and we've worked on various projects since. Mister Crimson was your second project to successfully be picked for the Zuda contest (the first was Pieces of Eve ) - what do you think of the Zuda process? Zuda is awesome and annoying at the same time. It's a great way to get some exposure and find fans of your work. Diego and I had gone through a few rejections and were kind of giving up. The feedback to Eden was awesome and really energized us. it was great to know people liked what we were doing. But at the same time, your standing depend on votes-- which is more based on how many on-line friends you have as opposed to your talent. That's not to say any of the winners on Zuda lack talent, but the votes and the comments always seem a little skewed. Mainly, as I said, it's great for exposure. Do you have any tips for other creators looking to enter the Zuda contest? Yes. If you're George Lucas, for example, don't give them your Star Wars. Give them your Howard the Duck, or Tucker. You're trading exposure for licensing rights. This isn't a secret, their contracts are very upfront-- but just keep in mind your participation is up to them. It was just announced several Zuda comics would be going to the Cartoon Network. Some of those creators may be involved, others not. It's up to Zuda. If you have a pet project, I don't recommend signing it out of your own hands. What do you think is future of comics? I don't think it is straight webcomics OR the current solicit to print to retail model to be honest. A lot of people just don't like reading on the screen, even if that is the future. At the same time though, as with music and film, the ease of acquiring comics online is killing the old standard distribution and retail methods. I see a future where comic companies offer some of a title as a webcomic, with an option to buy a download or print-on-demand version. As printing technology gets cheaper and better, the print run of a book will be a non-issue to the pros. We're not that far off from a double sided color laser printer being in people's homes. A downloadable, print-ready PDF with the comic in printer spreads could be bought cheap, printed for cheaper, and made at home. Comics on demand. Personally, I love going to my shop and browsing. I love the smell of ink on a new book. I love a story that's formatted for an online read in the middle of my workday. These things are great, but I think time and technology will supersede them both. What comics/web comics do you currently enjoy? I go through a lot of phases. As a kid I was a DC fan. As a teenager it was Marvel. In my college days, it was all indy stuff like Love & Rockets and 8 Ball along with the early Vertigo stuff. These days I'm split. I'm loving Vertigo's renaissance of going back to off-beat dark stuff. For superheroes, I'm a dedicated X-Men fan. Image puts out a great variety of genres that are fun. Walking Dead and Invincible of course-- and anything Jimmy V puts out via Shadowline. Got a favorite underappreciated comic story/arc? I don't know if it is under appreciated, but I want to say Desolation Jones. Despite being a Wildstorm book it never had a huge amount of lauding it deserves. It's pretty much my favorite work in all of comicdom. Great story telling, great art-- some funny, some scary, some ugly, some pretty. A little sci-fi, a little noir-- it's really perfect in my eyes, even with its brutal ending. Current trend in comics you hate right now? Decompression is getting tired-- unless it is balanced with periods of action. EVENT comics are tiring. DC I can't even follow with their Crises and Countdowns. I have no clue what is going on. Their books are almost indecipherable. I love what Marvel is doing, but they need to stop hopping from event to event and let their stories breath a little. I miss done-in-ones. Crimson is sort of my response to that-- it's very old school with it's narrative. Staccato and fast paced. Got a site or other project you would like to mention? Not YET. I've got some things cooking that are potentially big, but I'm superstitious and don't want to mention them until I've signed papers and gotten paid! That was the first TV series I worked on. I was hired as a "clean-up artist", but ended up actually doing character design. I had helped a friend do some in-between and clean-up on the animation of some video clip, and learned from him that they needed someone on Scary. I applied and got the job. The show was about 3 weeks behind schedule when I started working on it. It took about a month of hard work to get the show back on schedule. I was just starting in animation. Up to that point.... every jobs that I had were just that.... jobs. But then I got sidetracked into animation. So I did put a lot of work to try and make a name for myself in animation and to build my career as opposed to just move on from jobs to job. I tried to learn and improve myself as an artist as much as I could on each project that I have worked on. Sadly I have learned that there is always more to learn, and there is always room for improvement. Also, on some projects.... you don't learn/improve as much as you might have originally expected/hoped to. One of the problem is that.... learning to draw in the style of lets say "Scary", does not improve your own personal style much. It does help a little. It will make you draw stuff that you normally never draw. Cars.... guitars... cats..... whatever. Although not in your style. But in the end, to improve your own style.... you HAVE to draw in your own style. But when you work on an animated production 50, or 60, or heck 80 hrs per week, it does not leave you with much time to draw your own stuff in your own style. Although even then you do improve at least a little as an artist the more you draw. Drawing 8, 10 or 12 hours a day each day, you cannot help but improve. But sometimes, just not the way you wish to improve. In my previous Blog, I mentioned how I would have to turn down some job offers. In my next Blog, I will mention how I had to turn down to continue working Scary to go work on another project. Mister Crimson Web Comic Goes Live! The first installment of Mister Crimson, the FBU's first weekly webcomic goes live today! This installment includes the original 8 pages submitted for Zuda plus the very next, never before seen page 9. Mister Crimson will be updated every Tuesday. I focus primarily on Golden Age, Public Domain comics here each Monday, and that's because outside of illegal digital comics, there isn't a lot of legit FREE digital comics. Up until 2 years ago, Flashback Universe was about it. However, since then, several other creators have started using cbr as format to distribute their comics, and I want to introduce you to a couple of them today. The first is Misery Depot. Misery Depot is a free multilanguage comic drawn by Juan Romera and written by Hermés Piqué, intended for mature audiences. It can be read online as a webcomic or downloaded in various formats, such as pdf or cbr via torrents. Hermés credits Flashback Universe for giving him the inspiration for going digital, and so far he's had a great response to his comic. An anomaly causes an elder mother to awake undressed inside a humid capsule. The voice of her daughter echoes in her memory, the intent of her words forgotten. Was she sharing the completeness of their unity, or hatefully wishing her mother's demise? Another neat comic to check out in CBR format is Brian Robinson's The Incredible Amazing Five. As the title would suggest, it's a fast paced, fun filled jolt of super heroe action in the tradition of your favorite team books from Marvel or DC. I discovered Brian's site after he started following me via Twitter, and was surprised to see he had not one, but 3 issues of The Incredible Amazing Five on his site for download! Check 'em out! Mister Crimson @ Flashback Universe! Well, the Zuda site is a tough nut to crack, and Mister Crimson did not win the contest. However, it did win a place in my heart, as I felt the core concept was similar to the sort of things I like to see in the Flashback Universe. So, I contacted both Seth and Diego, and asked them would they be interested in finishing up the comic at Flashback Universe in the form of a weekly web comic. They agreed and the first installment will begin next Tuesday, here at Flashback Universe! 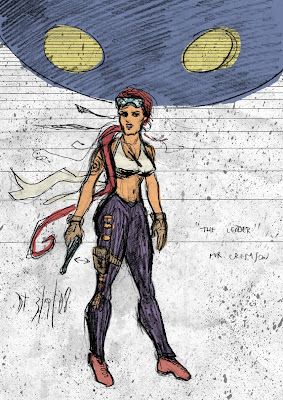 Mister Crimson is the story of a pulp-era superhero that has been abducted through time. Taken from the 1930s, and sent 200 years into the future he is forced to take up fisticuffs against a rebellion that hopes to overthrow the city's leaders. Mister Crimson is used to scraping his knuckles on shifty criminal types-- but here, he is forced to take on mutants and cyborgs who have powers that match his own. But Crimson was selected for this task specifically. His futuristic handlers know that in a word, he is unbreakable. Fighting criminals has always been Crimson's bag-- but soon he realizes this future is not what it seems. The city leaders are corrupt, and those mutants and cyborgs that have been branded as malcontents, are actually fighting the just cause. Does Crimson join them? Or does he continue to fight for the men who have the ability to send home? Crimson left the past at the worst possible moment. His arch-nemesis, Ace of Spades, had finally deduced his secret identity, and kidnapped Crimson's wife and son. Crimson had found Ace, and their final encounter had just begun when Crimson was snatched into his future. Mister Crimson faces his biggest dilemma. Does he quell the rebellion, and earn his ticket back in time to save his family? Or does he do what he has always done-- fight the good fight to protect the innocent? Even for a man that has no limits to his strength and invulnerability, this adventure could break him. What was the the inspiration for this series? Our main inspiration probably came from characters such as the original Sandman, the Shadow, the Spirit, the Crimson Avenger... and we also wanted to throw a science fiction element in the mix. 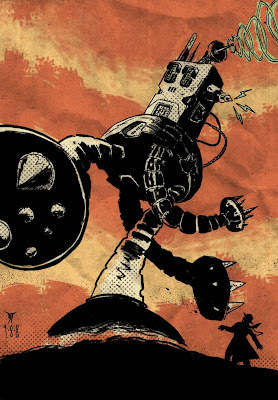 So pulp characters and science fiction are quite possibly the biggest influences on Mister Crimson, but I think it also has other elements from genres such as western and noir/detective stories. How do you feel about the Zuda competition process? The competition process is alright with me. I think that even before submitting, most competitors may have an idea of what to expect once your series is online. You are going to receive support from the readers who like your work, critiques from the ones that don't like it, but most of all, I think that with this being a competition it depends a lot, for a series to win the contract, that the competitors spend a good amount of time promoting their work and getting their friends/relatives/contacts voting for their comic. So, besides being a writer or an artist, for a competition process such as this, it's very important that you're a good self promoter as well. What would you tell other creators who are considering sending a project to Zuda? I don't really have any advice to give anyone. But if I have to give my opinion, I would say that you have to make sure you feel that your 8 pages are good enough, that's probably the most important thing and what will most likely determine if the series is going to enter the contest or not. Drawing new strips of a series I've been working on since 2006, called Bert Stroud, with writer Mike Schwalke. Another project is re-working a series called Mexican Death Trip, that I had originally started about 2 years ago, also with writer Seth Sherwood. We always liked the characters from that comic, so we plan to do something with them once again and try finding a publisher for that series. And I'll be working in short stories and illustrations for a book which will be an anthology of 2, with stories written and drawn by my friend writer/artist Norman Mallory ( http://www.ncmallory.blogspot.com/ ) and myself, but it's a project that, as I'm writing this, it's still on it's very early stages. Be sure to check back Tuesday for the first installment of Mister Crimson! That is what turned me into a DC fan. No, I did not buy it right away. So I only kept an eye out on what was coming out from time to time just to keep up with what was going on in the world of comics without ever really buying anything. I would buy an occasional issue of GI.Joe or something. But that was about it. Until one day while I was waiting for the bus and started going through the various magazines and comics at the newstand where I was waiting. Then I was hit over the head with a warhammer. I saw the cover of Action Comics #594 by John Byrne. I bought that comic and HAD to go buy some more. ...and Crisis on infinite Earths. I did not know much about the DCU at the time. I had only a handful of Batman comics. A handful of Superman comics. Very few Wonder Woman, Kamandi, Karate Kid, Legion of Super-Heroes comics. About a dozen issues of the New Teen Titans, and about 27 issues of the Flash (the DC series I had the most issue of at the time). And equipped with that knowledge, I would read CoiE featuring the entire DC.... not Universe... Multiverse. It literally blew my mind away. So although John Byrne's Action Comic issue is what attracted my attention and made me want to read more DC comics, CoiE is what introduced me to the richness of DC comics. It is what made me realise the huge tapestry that was DC comics and the rich history behind it. So after getting all the Superman and Action Comics that I could by Byrne, I discovered other comics. I started buying Batman drawn by Jim Aparo. Little did I know at the time that the issue I had just bought was the first issue of Jim Aparo's latest run. The timing was great. Green Arrow the ongoing series. I loved it so much I bought the Longbow Hunter mini as back issues for $20 each issues. Legends. Cool mini-series also drawn by Byrne. The Wrath of the Specter. Awesome mini series with some great artwork by Jim Aparo. Watchmen... what can be said about Watchmen that hasn't been told a thousand times already. Same with Dark Knight Returns. Hawk & Dove. First the mini series... then the ongoing series. Loved both for different reasons. But I was just the right age to identify with the characters being in college myself at the time. Strangely enough..... although I loved the Teen Titans by Perez in the early 80s, I was not much of a fan of the series at that time. The Deadshot mini series then the Suicide Squad (strange, but reading the Deadshot mini is what turned me into a Suicide Squad fan). And the series which got me intrigued about the JLI..... The Weird. Loved it. It got me to try the JLI comic (Around the time of Millenium I think). And I fell in love with the JLI comic. The artwork, stories and humour was like nothing we had seen before. And I even got a letter published in the column of JLA (no longer JLI by then) issue 31. And then we got Justice League Europe. Even better. So imagine how happy I was when I saw the "Formerly Known as Justice League", and later the "I can't believe it's not Justice League". It was like seeing some old friends that I had not seen for years. Am I still a DC comics fan??? Although I don't buy/read as many comics as I used to... I think that I still am. Although for a while.... I was getting my DC fix, heck..... my super-heroes fix mostly from the Justice League cartoon. Loved that series. But then there was The New Frontier. So good.... I can't find the words to properly explain how good it is. The Green Lantern/Sinestro Corps War (awesome event). Although since "Rebirth" and "Recharge" Green Lantern and the Green Lantern Corps have been pretty good so far. The Booster Gold series is pure fun. And we have Darkest Night to look forward to. Even if it is only half as awesome as the Green Lantern/Sinestro Corps War........ it will be great.